If you are here then it’s because you are interesting in reading a detailed Yonex Voltric 5 review. You probably know about the advantages of the Voltric rackets: Speed, power and control. That’s why many say it’s a blend of Arcsaber, Armortec and Nanospeed technology. The thing is that the top-ranked options like the Voltric 80 or 70 are quite expensive, yet, here you have the Voltric 5 which is fairly affordable. Let’s discover the most important things about this racket. Come with me and I will make sure you discover everything about it. Great handling. It is excellent in this department. Amazing power. It’s affordable, yet very powerful, which is great for attackers. Very agile and fast. That’s a benefit of the incredible Tri-voltage system. If you are looking for something affordable, powerful and fast paired with great handling, then you won’t go wrong with this racquet. It’s even a good choice for beginners who want to venture themselves with a heavy-head racquet. Do you still have doubts that claim for an answer? Worry not, because the review right below will clarify all of your doubts and answer your questions. Let’s check it right now. The design of this racket is quite good. It’s full black with yellow tones in the frame at 3 o’clock, 5 o’clock, 7 o’clock and 9 o’clock. Overall, the aesthetics of this racquet are excellent. 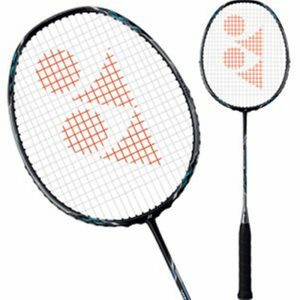 It’s cheap yet Yonex has done a good job at equipping it with the necessary technology for powerful shots and outstanding maneuverability paired with excellent control. It may not be the same as a Voltric Z Force II or a Voltric 80 or Voltric 70, but for the price it’s more than good. As usual, it comes with the Tri-voltage System. It combines the wonders of power and agility, to bring you a racket that moves fast and hits had. It allows you to hold the shuttle for long on the string bed, which makes your shots more accurate and powerful. If you want to deliver devastating shots, then this is the racquet for you. The racket cuts very well through the air thanks to its aerodynamic design. This, as you can easily guess, will give you an edge over your rival in terms of speed and swing. If you want a better experience, then this technology will bring you so. Great handling. Thanks to the new support cap you get a wider surface which makes the racquet easier to handle, which translates in more control and more power with every shot. Top-notch precision. Thanks to the tri-voltage system along with the built-in T-joint. You will experience less torque, and hence, more control and precision with every shot you deliver. And as if that were not enough, you also get an isometric frame shape that ensures you land more successful shots than with a conventional badminton racquet. These features make it an excellent professional badminton racket which can be yours for a low price. Yet, it’s enough talk about the specs, and now it’s time to talk about the performance in the game, because that is what really matters at the end of the day. Serving with this racquet is easy, as you don’t have to put much strength into play. You can easily direct the shuttle to your preferred objective in the field. For real, you cannot go wrong with a heavy-head racket. And the Voltric 5 does an amazing job with clears, as you can make them go as far as you want without much effort, all thanks to the incredible technology and the heavy weight of the head. This is where this racket shines. Even if you are not very strong, this racket makes it easy for you to deliver smashes packed with plenty of power. Your opponents will have a hard time blocking and replying them. A heavy-head racquet is not necessarily good for defensive-style players, but it does a good job with both defensive and offensive drives. Although, for this kind of players there are better options like the Nanoray Z Speed. Thanks to the great power it contains you can deliver devastating net kills that your opponents won’t be able to stop. It’s fast, powerful, affordable and solid. There’s no room to complaint about it, especially when you take into account how cheap it is.